Within a few years, you'll likely be carrying a smartphone, tablet or laptop with hundreds of gigabytes or even terabytes of hyper fast, non-volatile memory, thanks to two memory developments unveiled this week. First, Samsung announced it is now mass producing three-dimensional (3D) Vertical NAND (V-NAND) chips (seen at top); then start-up Crossbar said it has created a prototype of its resistive random access memory (RRAM) chip. Three-dimensional NAND takes today's flash, which is built on a horizontal plane, and turns it sideways. Then, like microscopic memory skyscrapers, it stacks them side-by-side to create a vastly more dense chip with twice the write performance and 10 times the reliability of today's 2D, or planar, NAND. The most-dense process for creating silicon flash memory cells to store data on planar NAND is between 10 nanometer (nm) and 19nm in size. To give some idea of how small that is, a nanometer is one-billionth of a meter -- a human hair is 3,000 times thicker than NAND flash made with 25nm process technology. There are 25 million nanometers in an inch. NAND flash uses transistors or a charge to trap (also known as Charge Trap Flash) to store a bit of data in a silicon cell, while RRAM uses tiny conductive filaments that connect silicon layers to represent a bit of data - a digital one or a zero. Which of the two memories will dominate the non-volatile memory marketplace in five years isn't certain, as experts have mixed opinions about how much 3D (or stackable) NAND flash can extend the life of current NAND flash technology. Some say it will grow beyond Samsung's current 24 layers to more than 100 in the future; others believe it has only two to three generations to go, meaning the technology will hit a wall when it gets to 64 layers or so. By contrast, RRAM starts out with an advantage. It is denser than NAND, with higher performance and endurance. That means RRAM will be able to use silicon wafers that are half the size used by current NAND flash fabricators. And, best of all, current flash fabrication plants won't need to change their equipment to make it, according to Crossbar CEO George Minassian. RRAM has some good things going for it. "It will cost maybe a couple million dollars in engineering costs for plants to introduce it. That's what it is in our plan," Minassian said. "It's about the same cost as introducing a new [NAND flash] node, like going from 65 to 45 nanometer node." Crossbar claims its RRAM technology has a 30 nanosecond latency time. Samsung's top-rated flash, the 840 Pro SSD, has a 0.057 millisecond latency. A millisecond is one-thousandth of a second, a nanosecond is one billionth of a second - a million times faster. According to Minassian, RRAM can natively withstand 10,000 write-erase cycles, which is a little more than typical consumer-grade MLC (multi-cell level) NAND flash can withstand today - and that's without any error correction code. ECC is used to upgrade today's MLC NAND flash to enterprise-class flash cards and solid-state drives (SSDs). "Silicon will retain its dominance over newer materials for as long as it can, and technologies like Crossbar's will play a niche role until 3D NAND runs out of steam," says Handy. Both RRAM and 3D NAND herald an enormous leap in memory performance and storage capacity. 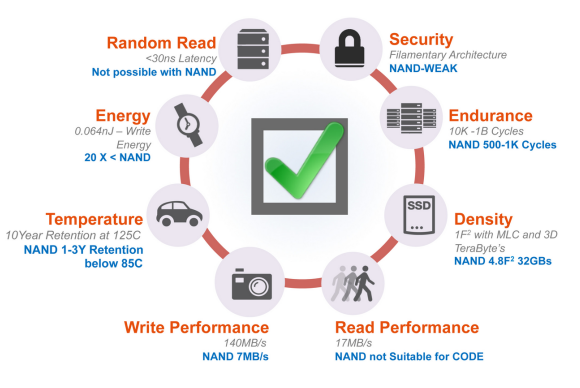 Crossbar's RRAM promises 20 times faster write performance and 10 times the durability of today's planar NAND flash. Like 3D NAND, RRAM memory chips will be stacked, and a 1TB module will be roughly half the size of a NAND flash module with similar storage, Minassian said. Three-dimensional NAND offers multiples more capacity. With every NAND flash "skyscraper" comes a doubling of capacity. Samsung said its V-NAND will initially only boast capacities ranging from 128GB to 1TB in embedded systems and SSDs, "depending on customer demand." So, Samsung appears to be betting on a manufacturing cost reduction - price per bit -- and not a capacity increase to drive V-NAND sales. Crossbar's initial RRAM chip will also be capable of storing up to 1TB of data, but it can do that on a chip smaller than a postage stamp; that amounts to 250 hours of hi-def movies on a 200mm square surface. A RRAM chip boasts 140MB/sec write speeds, and that's without parallel interconnects to multiple chips, Minassian said. Both 3D NAND and RRAM's purported performance gains mean that storage devices will no longer be the system bottlenecks they are now. In the future, the bottleneck will be the bus -- the communication layer between computer components. In other words, if NAND flash is a 100 mph car and RRAM is a 200 mph car, it doesn't matter how fast they can go if the road they're on has a curve that limits speeds to 50 mph. On top of performance, RRAM uses a fraction of the power to store data that NAND flash uses, meaning it will help extends battery life "to weeks, months or years," according to Crossbar. RRAM isn't the only memory advance in sight. Alternative forms of non-volatile memory that could be future rivals to NAND and DRAM include Everspin's magnetoresistive RAM (MRAM) and phase-change memory (PCM), a memory type being pursued by Samsung and Micron. There is also Racetrack Memory, Graphene Memory and Memristor, HP's own type of RRAM. Gregory Wong, founder and principal analyst at research firm Forward Insights, believes Crossbar's RRAM is a viable product that may someday challenge NAND, "and when I say NAND, I mean 3D NAND, too," he said. Racetrack memory still has at least five years go to go before it is even viable. "Right now, it looks like an interesting concept. Whether it eventually becomes commercialized or not is far out in the future," Wong said. "Phase change... well, there is some out there, but the question is, where does it fit in the memory market? Right now, it's a NOR replacement," Wong continued. "Its performance and endurance is like NOR, not NAND. "Generally, when you look at...others touting RRAM, there's a lot of skepticism, but when we looked at Crossbar and its technology, we found it interesting," he said. Handy also believes memory made with silicon, like Crossbar's RRAM, will continue to dominate the memory market because fabs are already outfitted to use it and it's an inexpensive material. "Silicon will retain its dominance over newer materials for as long as it can, and technologies like Crossbar's will play a niche role until 3D NAND runs out of steam, which currently looks like it will happen two to three generations after 2D runs out of steam, which is two to three process generations away from where the market is today," Handy said. "Moving to 3D allows for the NAND technology to continue to scale down. How far can it go? I think it can go quite far," he said. Lee said he's already seen fabrication plant roadmaps that take 3D NAND out to 128 pairs or layers. This story, "Next-gen storage wars: In the battle of RRAM vs 3D NAND flash, all of us are winners" was originally published by Computerworld.